Win a Hospitality Day at Northampton FC - Last Few Days To Enter! 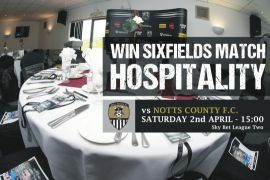 Don’t forget you only have a few more days to enter Imperial Car Supermarket’s fantastic competition to join us and The Cobblers on 2nd April 2016 for the Notts County Game. In order for a chance to win, all you need to do is take a guess at the stadium attendance for the Newport County game which is happening on 25th March. To enter the competition, visit the Imperial Car Supermarkets Facebook page and send us a direct message with your guess. The three closest entrants (and a friend each) will be our guests at the Notts County game on the 2nd April 2016 at Sixfields. The closing date for entries is the 24th March 2016, so get your entry in nice and quick for a chance to win this great prize. What a fantastic day out for for our lucky winners, come and enter before it’s too late! It’s easy to find a fantastic used car at Imperial Car Supermarkets. With plenty of detailed photos for you to view inside and out of the car, plus a 360 degree view, why not browse our current quality used cars for sale now?